The University of Wisconsin restructured head football coach Paul Chryst’s contract recently, but he still remains in the bottom half of the Big Ten in football coaching salaries. Chryst 5-year deal gives him a $300,000 annual increase, but he’ll enter the 2019 season no better than ninth among the 14 Big Ten head coaches. Chryst is set to earn $4.15 million this coming season. 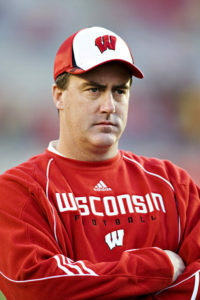 Chryst’s base salary is $400,000. The remaining $3.75 million comes from the UW Foundation. The Badgers finished 5-4 in the Big Ten last season and 8-5 overall. In Chryst’s first three seasons saw the Badgers go 10-3, 11-3 and 13-1. With Ohio State’s Urban Meyer retiring, Michigan’s Jim Harbaugh becomes the Big Ten’s highest paid coach. Harbaugh earned $7.5 million last season. Nebraska’s Scott Frost and Illinois’ Lovie Smith both earned $5 million. Purdue’s Jeff Brohm earned $3.8 million last season, but after being courted by Louisville, Brohm got a new deal with the Boilermakers that could be worth up to $6 million a year. San Francisco 49ers coach Jim Harbaugh grew up hearing about the Packers, to the point where they were made to be the team to beat. Now Harbaugh and his 49ers will line up against the Packers again, in the season opener on Sunday.